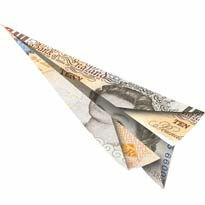 A currency specialist has reported an increase in the amount of British expatriates sending money back to the UK. Moneycorp has reported that the amount of British expats sending money back to the UK has doubled in the last year, and on average the size of these transfers has also increased, by around 15 percent. It is suspected that some expats are experiencing difficulties in areas such as Spain and Greece, and therefore feel compelled to send money home in case they have to move back due to economic downturn. Expats in the Eurozone are reportedly experiencing the most difficulties, just under 50 percent of all the money sent back came from Spain, however this could also be affected by the Spanish property row that is causing many problems for British expatriates in Spain. Another issue for some expats is that their pensions are losing value as the pound loses strength. Financial experts have been commenting on the weak pound for some time now: “It is easy to see why people are so concerned at the moment. The pound has fallen by around 20 per cent against the euro in the past three years and is currently struggling to hold its own against local currencies in most major expatriate centres,” one expert said.